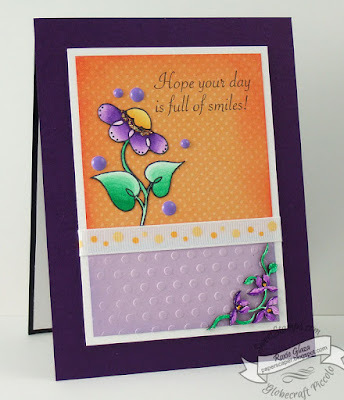 The panels were ink distressed with Ranger Distress Ink and the lilac image was dry embossed using a Cuttlebug folder. The paper flower was colored with Chameleon Pens VO4, OR4, VO3, GR3, cut out and glued to the panel. Diamond Stickles was applied to image. The bookboard corner accent was heat embossed with Micro White powder and colored with the same Chameleon Pens that were used for the paper flower, and then glued to the card with Aleene's tacky glue. What a beautiful design, I love how you matched the colors in the vine corner to the flower.